Before when appending into a shared Recital table each new row was locked along with the table header, then unlocked after it was inserted. This operation has now been enhanced to lock the table once, complete inserting all the rows from the table and then unlock the table. The performance of this operation has been increased by using this method. All the database and table constraints are still enforced. Here's how to set up field validation for a field with a small static number of acceptable values. Using the example.dbf table from the southwind sample database, validation can be added to the title field to ensure it matches one of a list values. The inlist() function checks whether the specified expression exists in the comma-separated list which follows. 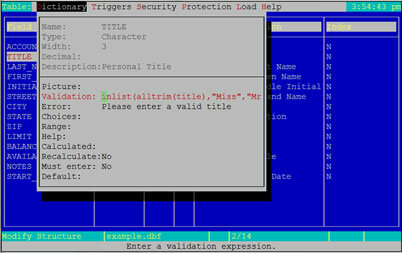 An attempt to update title with a value not in the list will give an error: Validation on field 'TITLE' failed. This command is used to copy an existing database to a new database. By default an error will be returned if the target database already exists. Specifying the optional IF NOT EXISTS keywords no error will be returned if the target database already exists. If the optional IF EXISTS keywords are specified and the target database already exists, then it will be removed before the copy. Both the databases must be closed before they can be copied. If you want details about how storage devices are performing on Redhat/Centos/Fedora use the vmstat and iostat commands. Occasionally as a Linux administrator you will be in the situation where working on a remote server and you are left with no option but to force a reboot the system. This may be for a number of reasons, but where I have found it most frequent is when working on Linux clusters in a remote location. When the "reboot" or "shutdown" commands are executed daemons are gracefully stopped and storage volumes unmounted. This is usually accomplished via scripts in the /etc/init.d directory which will wait for each daemon to shut down gracefully before proceeding on to the next one. This is where a situation can develop where your Linux server fails to shutdown cleanly leaving you unable to administer the system until it is inspected locally. This is obviously not ideal so the answer is to force a reboot on the system where you can guarantee that the system will power cycle and come back up. The method will not unmount file systems nor sync delayed disk writes, so use this at your own discretion. To force the kernel to reboot the system we will be making use of the magic SysRq key. The magic_SysRq_key provides a means to send low level instructions directly to the kernel via the /proc virtual file system. Voilà! Your system will instantly reboot. There's a nice article on IBM developerworks describing how to package software using RPM. You can read it here. Hdparm can be used to view or set many hardware characteristics of IDE or SATA drives including optical drives (and even some SCSI drives). For example, the read-lookahead feature can be enabled or disabled. Also of interest is that the on board write caching can be disabled. This may or may not be of use when trying to optimize the writing of data to the drive especially when the operating system and/or file system itself may also perform write caching. Some options of hdparm are dangerous and are generally listed as such in the man page. Hdparm is available from SourceForge and there is even a version for Windows.